Borri, an elderly priest, is one of the reclusive Greybeards in High Hrothgar who refuses to speak, lest a mere whisper of their voice unleashes destruction. Borri teaches you the first word of the Whirlwind Sprint shout, Wuld, during The Way of the Voice. He will react when interacted with, greeting you with a muttered "Dovahkiin" and causing the surroundings to rumble in doing so. 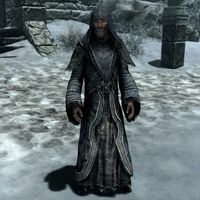 Borri wears a set of Greybeard's robes with the matching hood and boots. He carries a flute, one sample of ice wraith teeth, an amulet of Talos, and one sample of snowberries. He will start his day at 4am, rising from bed to meditate inside facing the windows, on the mats, changing to a different window each hour. At 12:30pm, he will meditate in the courtyard, as well as in the courtyard tower, occasionally using the Clear Skies shout while up there. At 4:30pm he will meditate in front of the shrine in the main entry hall, and at 8pm he will meditate in the main entry hall, rotating positions in a clockwise direction every hour until retiring to his sleeping quarters at 12:30am to read; finally retiring to bed at 2am. He will then sleep for two hours and repeat his daily routine. Borri knows the following shouts: Disarm, Dismay, Elemental Fury, Fire Breath, Frost Breath, Ice Form, Unrelenting Force, and Whirlwind Sprint. Aside from his greeting to you, the only other word ever heard by Borri is the shout "Bex!" during the quest The Way of the Voice. The shout in English means open. Borri is one of only two NPCs in Skyrim that are level 100, the other NPC being the Greybeard Wulfgar. This page was last modified on 19 March 2016, at 21:10.